It has been an amazing year for stocks, but even in a great year stocks don’t increase every day. Recent winning streak ended at 8 as S&P 500 fell 0.61% on Tuesday. Nasdaq fell 0.56%, Russell 2000 fell 1.22%, and VIX increased 8.35%. Traders were intensely short the VIX heading into Tuesday. This increase could easily be the start of that trade unwinding, causing stocks to fall a few percentage points. The good news is the CNN fear and greed index fell from 74 to 70 which is still greed. Every sector fell except communication services and utilities which increased 3 basis points and 0.26%. On the negative side, energy and industrials were the worst sectors as they declined 1.29% and 1.4%. Personally, I think this earnings season won’t be as bad as some initially feared a few weeks ago. My prediction is mainly based the initial results. It’s worth noting that if I’m incorrect and guidance is awful again, the stock market should fall over 10% from here. It’s interesting that the ECRI leading indicator predicted Q2 and Q3 would be worse for the economy than Q1. Yet the estimate changes for next quarter aren’t as bad as they were for this quarter. That’s probably because the uncertainty around markets, the Fed, and trade caused maximum negativity to be included in analysts’ estimates after last earnings season. To be clear, estimates for the rest of the year are still falling. It’s just that they are falling at a slower pace than last quarter. As you can see from the chart below, with 23 firms reporting results, Q2 estimates have fallen 3.44%. Q1 estimates fell an astounding 6.71% after the first 23 firms reported Q4 2018 results. Last quarter was a blood bath. Stocks were correct to rally in January and February even as estimates cratered. As you can see from the table, 61% of firms had their estimates lowered which is better than the 74% that were lowered last quarter. The dispersion of results isn’t much worse than the 3 year average, but the estimate decline is much worse as estimates usually only fall 1.06%. It’s worth pointing out that the 3 year average is artificially propped up by the tax cut. Even without the tax cut though, this estimate decline would likely be worse than average. The rally in stocks has had a modest reflexivity effect on the economy as consumer sentiment has perked up. Stocks End Streak - Stocks are accurately reflecting earnings expectations. 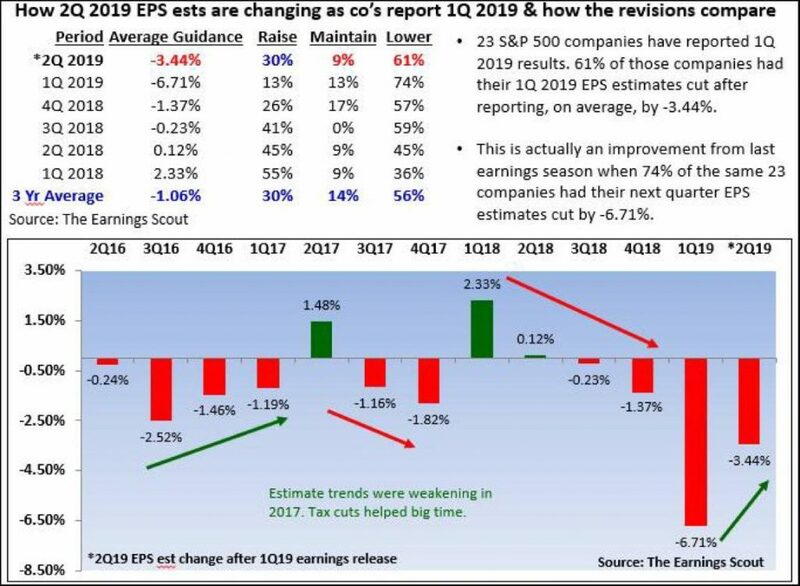 As you can see from the chart below, Q1 EPS is supposed to be down 0.89% yearly. Growth is expected to pick up in the next few quarters with a 14.5% increase occurring in Q1 2020. The warning here is that Q2 2019 estimates will likely fall to negative growth even if this is a solid quarter since they usually fall. Q2 could be like this quarter where estimate beats turn negative growth positive. To be clear, FactSet is showing EPS falling 4.2% in Q1. Either way, it’s more about the rate of chance of estimates, not the net value. Rate of change determines stock prices, while net growth determines PE multiples. The other warning is that estimates further than 1 year out usually start at about 10% growth. Economists and analysts know little about Q1 2020. Estimates are so high for that quarter because the results are going to be weak in Q1 2019 even if they are soundly beat. It’s still possible that earnings meet those Q2 2020 estimates; we just need to see the economy turn around. Even though the ECRI leading index’s yearly growth rate has rebounded sharply, it’s far from a lock that Q1 2020 will be a great quarter for the economy. It will likely be better than this quarter at least. The ECRI leading index has been pushed higher by stocks, once again showing the power of reflexivity. Ned Davis Research’s prediction of a global recession has come true. That’s based on the IMF’s forecast for growth. The IMF is usually behind the curve unlike Ned Davis’ indicator which forecasts recessions in real-time before they occur. A global recession is nowhere near negative GDP growth as growth almost never falls that low. As the Chinese economy’s growth slows and global population growth in the developed world gets worse, it’s possible that negative growth will be more common in the future, like it is in Japan. A recession is all about growth being below potential. As you can see from the table below, the IMF is forecasting 3.3% global growth in 2019 which is down from its forecast of 3.5% in January. I already knew growth was going to be weak at the start of the year. Stocks End Streak - Now the global economy actually looks slightly better as the global PMI increased in March. As you can see, growth will fall from 3.6% in 2018. Even though American growth is expected to beat the advanced economies’ growth rate by 0.5%, it is expected to play a big role in the growth decline from last year as America’s GDP growth could fall from 2.9% to 2.3%. Germany and Italy are also big losers as their growth rates are expected to fall from 1.8% and 0.9% to 0.8% and 0.1%. China and India are headed in opposite directions as China’s growth will fall from 6.6% to 6.3% and India’s growth will rise from 7.1% to 7.3%. 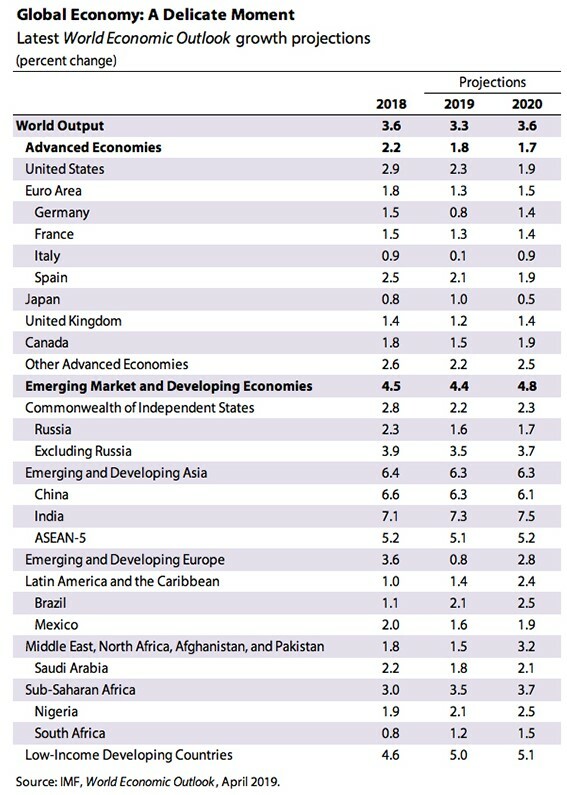 Overall, emerging and developing economies’ growth is expected to fall from 4.5% to 4.4%. Stocks ended their 8 day winning streak. 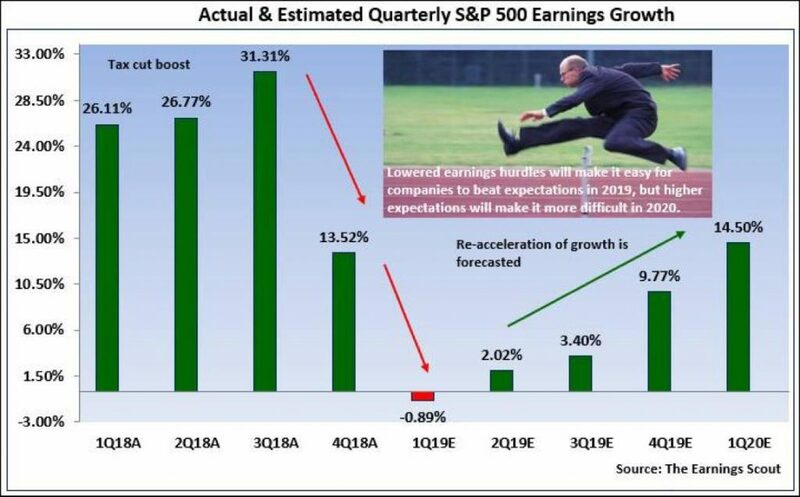 Q1 earnings season won’t be a disaster, but it will be worse than the 3 year average. Early findings tend to be highly accurate at predicting where the rest of the season will end up. This forecast solidifies the prediction of a global recession as GDP growth is expected to be the lowest since the 2007-2009 financial crisis. It’s highly possible if China improves slightly that the recession will be over before the end of this year.